The Massachusetts Bay Transportation Authority (MBTA) has concluded a three month investigation into a scheme resulting in 200 buses not receiving inspections for mechanical problems and routine maintenance services. The MBTA provides public transportation services to Massachusetts residents throughout the Greater Boston area. At the close of the investigation, 13 managers were fired for falsifying the mileage records of 200 buses to avoid scheduled inspections. Six other managers received three day suspensions for lesser roles in the scheme. Unless additional information becomes known, the MBTA does not anticipate terminating any other individuals. According to MBTA General Manager Richard Davey, the MBTA has mostly caught up with the inspection backlog. Officials also stated that the deferred inspections did not cause any known safety problems or accidents because bus drivers visually inspect the buses before use. The MBTA requires bus inspections every 6000 miles. According to reports, some of the affected 200 buses went over 35,000 miles without inspections. An anonymous terminated superintendent is claiming that the disciplined managers are taking the fall for a widely recognized policy of pushing off routine inspections and were reacting to pressure from higher management to keep buses in service. He says he is considering legal action against the MBTA. The terminated superintendent says it is common within the MBTA to treat serious issues immediately but postpone the scheduled inspections if the buses were needed for service due to emergencies or track repairs and that management was aware of this policy. State Transportation Secretary Jeffrey B. Mullan said several government departments have been notified about the inspection issue and the agency is reviewing whether any criminal or civil laws have been violated by the false records or missed inspections. For more information on the MBTA inspection issue, see this Boston Globe article. Despite recent accidents, the MBTA continues to maintain that the automated operating systems that have been very successful at preventing accidents in other parts of the country are an unnecessary expense for the citizens of Boston. It is no secret that these systems could have prevented two serious rear end crashes on the Green Line in the last year alone. These systems would virtually eliminate driver error by automatically stopping trolleys from running red lights or getting dangerously close to other trolley cars. While some MBTA officials have argued that the safety systems would not be a good allocation of funds, recent events have made it fiscally irresponsible for these delays in adequate safety to continue. There have been five crashes since 2007, and the most recent crash will cost the agency more than 10 million dollars in property damage and the medical claims of the victims. The crash on May 8th near government center epitomized the need for the system upgrades as nearly 50 peoples were admitted to the hospital as a result of their injuries sustained in the crash. The accident appears to be the result of carelessness by the operator who was text messaging at the time. This is the exact type of accident that would have been avoided with this proven technology in place. Implementation of the new safety measures in other cities has been very successful. One example of this is San Francisco. The Muni Metro in San Francisco was experiencing many of the same problems in 1998 that Boston is dealing with now. After a week of the new system, even initial critics of the state spending were glad to have the automated system in place. Not only were the trains safer, but they were actually able to reduce the time between trains for their customers. Instead of two minutes or more between trians the automated system was able to run them every minute. Since the inception of this safety precaution in 1998 there has not been a single rear end crash. It is past time for the MBTA to invest in the safety of its system to protect its passengers. Two MBTA Green Line trolleys collided in the tunnel near Park Street Station in Boston, and the accident is being blamed on the operator of the train who was texting his girlfriend while driving. His recklessness forced the train he hit 100 feet down the tunnel, derailed both trains, and injured dozens of passengers on both trains. The train crash occurred at about 7:18 PM, and the westbound trolley cars were full of commuters headed home and families headed to the Red Sox game. Dozens of people were taken to area hospitals, some with orthopedic injuries. According to investigators, the first trolley, which consisted of two cars, was stopped at a red signal short of the station. The second trolley, which also had two cars, rear-ended the stopped train. The 24-year-old driver was looking at his cell phone, texting his girlfriend, and when he looked up it was too late to stop. Investigators have not yet determined the speed of the train. MBTA drivers are forbidden to use cell phones or to text while driving. According to T General Manager Daniel Grabauskas, the driver will probably be fired (we hope so! ), and he may also face criminal charges. The MBTA will be held liable for the injuries sustained by the passenges on the trains. The T is vicariously liable for the negligence of its operators, and operator negligence seems extremely clear in this case. As a common carrier, the MBTA has a high duty of care to its passengers to prevent accidents. An 82-year-old woman has died following an escalator accident at the MBTA State Street Station in Boston. According to initial reports, the woman fell on the escalator and her clothing became entangled in the machinery. The accident is being investigated by the MBTA, the Massachusetts Department of Public Safety, which is in charge of escalator inspections, and the Suffolk County District Attorney’s office. According to news reports, the woman, who was traveling to an eye appointment on the MBTA, was riding the escalator up from the platform. She was near the top of the escalator when she apparently fell, and her clothing became tangled in the escalator machinery. News reports also indicate that she suffered a heart attack, but it is not clear whether that heart attack was before or as a result of the accident. MBTA escalators have been the cause of accidents and wrongful death in the past. An East Boston man died on an MBTA escalator when his sweatshirt hood got caught in an escalator in Cambridge. A three-year-old boy suffered severe leg injuries on the old Aquarium Blue Line stop’s escalator in Boston. Several people were injured in a Back Bay escalator accident when the escalator suddenly stopped, hurling the passengers down the stairs. The Aquarium T escalator, and the escalators at Back Bay have frequent scenes of accidents. Escalator inspections are conducted by the state each year, and the escalator involved was reportedly also inspected each week and maintained on a monthly basis. The record of this escalator has not yet been made public. Escalators are large powerful machines, and riders take for granted that they are designed and maintained for safe operation. Some types of escalator accidents are common, however. Entanglement of clothing in gaps in the machinery can involve shoe laces, clothing, backpacks, and even shoes themselves. For example, there has been an increase in accidents reported in children wearing Croc rubber sandals. 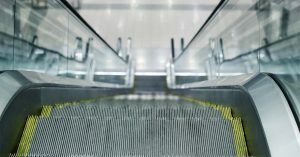 Thousands of people are treated each year for escalator injuries and deaths, many of which result of the negligent maintenance of escalators, or the defective design of the machinery itself. A Suffolk Superior Court jury today awarded $3.98 million to a South End woman who was run over by an MBTA bus on September 13, 2005. The verdict, with interest, will result in a judgment over $5.4 million for Rita Traybman, who lost her right leg when it was crushed by the bus. She was run over while crossing the street in a crosswalk. The verdict is believed to be one of the largest ever in Massachusetts for an injury of this kind. Ms. Traybman’s lawyer, Boston attorney Marc L. Breakstone, who has handled several bus accident and train accident cases against the MBTA, said, “This verdict will help Ms. Traybman cope with the terrible injuries she sustained. She will be able to obtain appropriate housing and medical care for her life-long disability.” Mr. Breakstone is a member of the personal injury law firm Breakstone, White & Gluck, PC, in Boston, MA. UPDATE: Breakstone, White & Gluck will be representing the most seriously injured passenger from this accident. Please check our news page for more information on the suit filed for this MBTA accident case. operator of the second train dead, and dozens of passengers injured and hospitalized. The accident happened as the commuter trains were approaching the Woodland Station in Newton. The first two-car trolley was stopped at a red signal when it was rear-ended by the second two-car train. Both Green Line trains were packed with evening rush-hour commuters, heading home at about 6:00 PM. Passengers were thrown to the floor. Several were treated on a nearby golf course; several were taken by ambulance to area hospitals with serious injuries; one was taken by MedFlight to the trauma center at Boston Medical Center. Many other passengers found their way to hospitals on their own. Both of the smashed MBTA trains were derailed by the impact. Reports indicate that some passengers were thrown as much as 20 feet inside the cars.